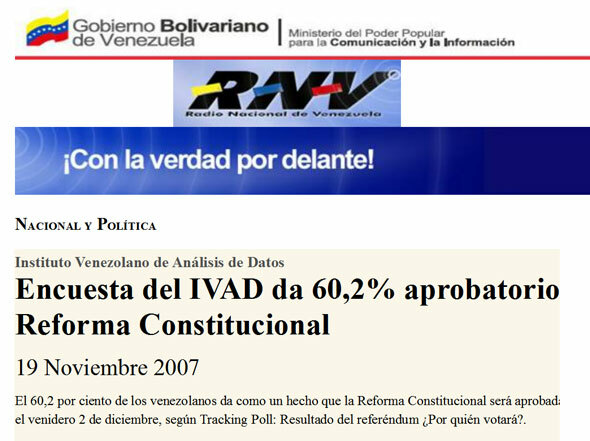 Not IVAD’s proudest moment, but proof positive that they lean toward the government – a few weeks after this headline, the opposition defeated the government by two percentage points. 49.8% of those polled are either opposition or lean opposition, while 32.5% are either pro-government or lean pro-government. The whole poll is here. A few things pop out. First, the focus of the poll seems to be Leopoldo and his proposal for a Constitutional Assembly, which is fine. But what is surprising is the strength of the proposal for a Constitutional Assembly: a sizeable chunk of those polled, 41.4%,say they are willing to sign their names to call a Constitutional Assembly. I think the #2019 faction has to answer a basic question: faced with this scenario, what exactly is the case for stating that we should wait, that now is not the time to act? (Note: I don’t think IVAD releases its polls, so this is probably a leak; however, it comes from @puzkas). Next articleHave you seen the latest economic indicators? Didn't think so.